Although the novel lacked what critics called “the maxillary crunch” of its predecessor “Jaws’, Peter Benchley’s Bermuda-based 1991 eco-thriller “Beast” was a man-eating sea monster story with an environmental moral. The title creature — a 100-foot giant squid — only moves up the food chain to begin devouring humans after Bermuda fishermen indiscriminately devastate the island’s reef fish using vast commercial fish traps. Loosely based on events leading up to the Bermuda fish pot ban in 1990 — introduced after the entire ecological balance of the island’s reefs was upset by overfishing — Mr. Benchley’s novel also drew on research being conducted here at the time into the habits of the elusive giant squid. As in “Jaws”, the book opens with a description of the title monster, lurking in the darkness of the ocean: “It hovered in the ink dark water, waiting. It was not a fish, had no air bladder to give it buoyancy, but because of the special chemistry of its flesh, it did not sink into the abyss. “It was not a mammal, did not breathe air, so it felt no impulse to move to the surface. It hovered. It was not asleep, for it did not know sleep, sleep was not among its natural rhythms. It rested, nourishing itself with oxygen absorbed from the water pumped through the caverns of its bullet-shaped body. Its eight sinuous arms floated on the current; its two long tentacles were coiled tight against its body. 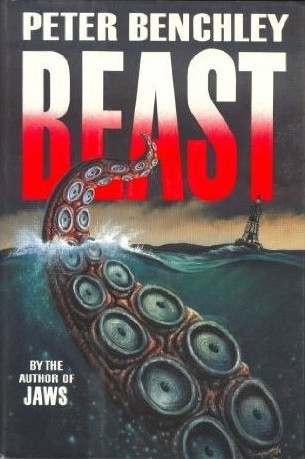 Many of “Beast” was a product of Mr. Benchley’s imagination, but some details– like the story he tells of “something” dragging fishermens’ pots around the ocean floor at great depths — have a basis, if not in fact, then certainly in Bermuda folklore. As reported by Richard Greenwell in the “International Society of Cryptozoology Newsletter”, Bermudian fisherman John P. [Sean] Ingham was having a lot of trouble with his traps in the mid-1980s. A deepwater crab and shrimp fisherman, Mr. Ingham’s traps were regularly lowered to depths of between 1,000 and 2,000 fathoms. And these specially reinforced traps were coming back up bent and twisted — in some cases, not coming up at all. On September 3, 1984, Mr. Ingham was winching up a trap that had been on the bottom at 500 fathoms. About halfway up, the line broke. It would take a weight of over 600 pounds to break the line, which was polyethelyne rope. Dr. Bennie Rohr, a biologist with the National Marine Fisheries Service Southeast Laboratory at Pascagoula, Mississippi, suggested that it might be the work of a giant octopus, since a full cage of tasty shrimp or crabs would be the perfect bait for it. On another occasion, when a smaller trap was being hauled up from 480 fathoms, the trap seemed rooted to the bottom as if something very heavy was holding it, and the line, with a 4,500-pound breaking strain, was beginning to give. “Beast’s” hero is Whip Darling,a fisherman struggling to make ends meet in Bermuda’s fished-out waters. When he finds an abandoned raft emitting a distress signal and covered with a mysterious ammonia-scented slime and a curious claw inside these are the first clues to the danger lurking beneath the sea. The claw is subsequently identified by Dr. Herbert Talley, one of the world’s leading experts in cephalopods, as being from one of the tentacles of Architeuthis dux, the giant squid. When two young divers are killed while exploring a shipwreck, panic ensues and Bermuda suffers an economic blow as the man-eating squid scares tourists away. Darling is then tasked with finding the sea creature and killing it despite his personal belief the squid should just left alone. The book — Mr. Benchley’s second Bermuda-based novel after “The Deep” – was a bestseller and adapted into a 1996 TV mini-series although the location was changed to the US West Coast for budgetary reasons. A friend and admirer of Bermuda diver Teddy Tucker – the inspiration for “The Deep’s” adventure-seeking sea-dog Romer Treece — Mr. Benchley served on the international advisory board of the Bermuda Underwater Exploration Institute [BUEI] from its opening until his death in 2006. 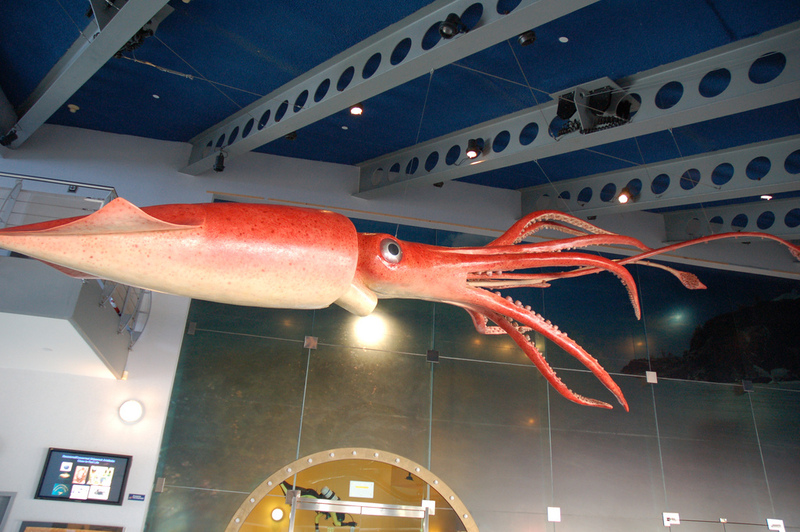 A full-scale model of a giant squid hangs from the ceiling in the BUEI’s mezzanine [pictured below].